Screen Size (inches): 40 "
Free delivery, got mine coming Saturday. £399 for this TV is a great deal. Heat. I have this very TV. It is excellent for the money and - considering it's an LED panel - the speakers sound rather good too. Just today rigged it up via HDMI for the xbox and it looks luuuurverly!! Superb deal, can't see it cheaper anywhere else, might just go for it!! would snap it up if it was 3d, but good price anyway.. When it says wifi ready do I need to buy anything like a dongle to add to it or will it just pick up the wifi straight away? Might sound like a stupid question but I'm not up with all this stuff. No dongle required if its Wifi ready. Can you download any Apps onto this TV (eg from Google Play?) or are they preloaded Apps - like the BBC News one shown in the image? Dongle is required for WiFi, not sure what type exactly as I've set mine up with an ethernet cable. No, can't use Google apps. Apps are pre-installed and additional available from in built Samsung app suite. Great tv for the price but beware of the blue glow round moving objects on factory settings. You can mostly eliminate it using a heavy cut of blue hue in the settings. got this from JL with 5 year guarantee in jan for this price. worth attempting the price match. 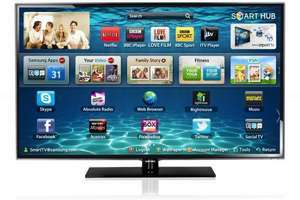 if you can get it with the 5 year guarantee its a good deal still quality tv. sound could be better but is impreasive compared to others of a similar thinkness. Good deal. How do you go about trying to get JL to price match? Would this be good to use as a pc monitor? Also, would they price match with a TV that you need a code to get the set at that price? Is it just this Samsung model that has the motion blurring? Or all of them, even the more expensive one's? Is it just this Samsung model that has the motion blurring? Or all of … Is it just this Samsung model that has the motion blurring? Or all of them, even the more expensive one's? I took a print out to John Lewis and they price matched to £419.99, which I was happy with. Even if Co-Op Electrical is outside their matching promise (I'm not sure if it is or not) I think they were just happy to sell the TV at a £30 discount (less than 7%). Happy with the extra £20 for a 5 year guarantee. Awesome deal, got this 2 weeks ago, wish I had waited! Great for sky HD, Blu ray and Xbox, smart stuff I useful but a mixed bag, does have Spotify on which is awesome! Heat added. I took a print out to John Lewis and they price matched to £419.99, which … I took a print out to John Lewis and they price matched to £419.99, which I was happy with. Even if Co-Op Electrical is outside their matching promise (I'm not sure if it is or not) I think they were just happy to sell the TV at a £30 discount (less than 7%). Happy with the extra £20 for a 5 year guarantee. do I have to go in-store to get them to price match ? or will they do it over phone as not a JL near us. do I have to go in-store to get them to price match ? or will they do it … do I have to go in-store to get them to price match ? or will they do it over phone as not a JL near us. Out of stock at CO OP and JL. There's a form you can fill in online to ask them to price match: … There's a form you can fill in online to ask them to price match: https://www.johnlewis.com/never-knowingly-undersoldWorth a try. Tried a JL price match before it was out of stock. They would match the £419 but not the £399.